UH Bauer students and corporate recruiters spilled into three ballrooms at the UH Hilton Hotel during the Fall Career Fair. Thousands of UH Bauer College students looking for internships and preparing for the job market after graduation met with recruiters from the area’s leading businesses at the Fall 2008 Career Fair held by Rockwell Career Center in September. Representatives from more than 150 companies attended the fair, which has more than tripled in size in the last year. Bauer College produces a very qualified crop of potential employees, said Brandee Houston, a recruiting manager for PricewaterhouseCoopers. A “Reverse Career Fair” held before the main event gave student organization members the opportunity to mingle with representatives from more than 150 companies. The biannual Career Fair gives recruiters the opportunity to connect with students on a more personal level than simply receiving a résumé in the mail, Houston added. Even if students weren’t offered a job or internship on the spot at the fair, they had the chance to network and make important contacts to secure an interview, said Jamie Belinne, assistant dean and executive director of the Rockwell Career Center. Cox, who is the vice president of APICS, the association for supply chain management students at Bauer College, also connected with recruiters at a Reverse Career Fair prior to the main event. 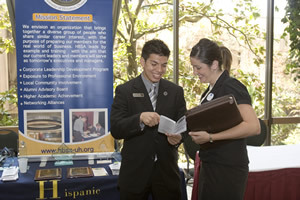 There, business student organizations hosted tables and shared information on their groups with recruiters.